June 25, 2018 This post may contain affiliate links. I’m obsessed! 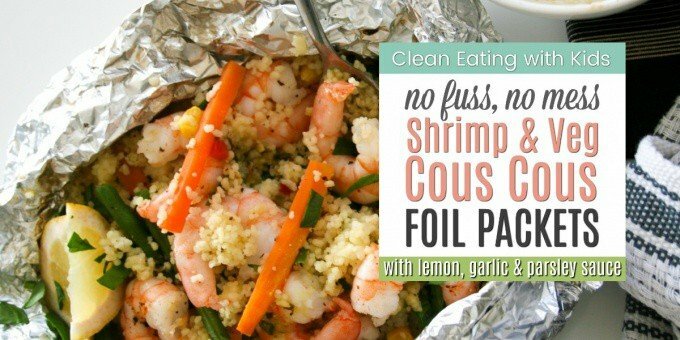 I made these individually wrapped shrimp and cous cous foil packet dinners on the grill this week and now I can’t stop. Foil Parcels are officially my favorite way to cook everything! They are super easy, require zero cleanup and well – they just rock! Are you ready to try something new? Give these easy, 30 minute, all-in-one foil wrapped dinners a go. 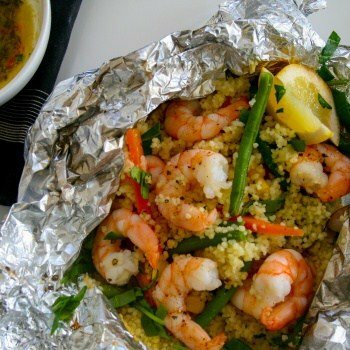 Shrimp with fresh vegetables & seasoned cous cous smothered in a parsley, lemon and garlic sauce and then tightly wrapped (to seal in that flavor of course) in individual foil parcels. Then … and I’ll leave this part up to you… you can either bake them in the oven or… delight the kids (and I recommend this bit) by lighting the fire or turning on the grill and hosting an impromptu mid week family barbecue. (NOTE: Use a heavy duty foil like this one if you are cooking your foil pockets on the grill. It makes it easier to turn them over and less likely to tear when kids are ‘helping’. Also, if you have one of these, it makes them a lot to easier to cook and turn a few foil parcels in one go on a camp fire). My kids loved these! It was so cute watching everyone (including my big teen boy) carefully unwrapping their individually wrapped dinner parcel. It felt a bit like Christmas morning. All that wasted time! I’ve waited way too long to try these. But I’m making up for it. We’ve foil wrapped our dinner twice now in 2 days. And I’m already wondering what dessert I can try next. Because that would be awesome! We were planning to have Roast chicken last night for dinner, but instead dinner was a simple chicken, potatoes and vegetable foil parcel. Sorry, no pics because lighting was bad and kids were hungry. I pretty much did the same thing as I did for this shrimp and cous cous recipe – popped chicken, potatoes and vegetables in a foil wrapper and popped it on the gas Barbecue on medium heat (we have a Baby Webber which is amazing) for 30 minutes. Voila! happy kids, happy Hubby and super happy Mom (because their were absolutely no dishes to wash). I love how quickly these foil parcels cook. Our Lemon Garlic Shrimp and Cous Cous Dinner took less than 30 minutes to cook including prep time. Preheat the grill or oven while you prepare everything. By the time you’ve assembled your little foil packets, the the grill (or oven) will be good to go and dinner can be ready 20 minutes later! The flavor is brilliant because everything is sealed inside and cooks in it’s own magical foil bubble. My daughter helped me assemble these foil packets, but next time I will let each child make their own. This was a fun dinner to make together. Even the smallest child will be able to stack up their little dinner parcel, but they may need help wrapping – you wan’t it sealed tightly to stop tasty flavors dripping out. It gives them each an opportunity to add their own spin on their dinner. Are you ready to try something new? Give these easy, 30 minute, all-in-one foil wrapped dinners a go. Shrimp with fresh vegetables & seasoned cous cous all smothered in parsley, lemon and garlic sauce and tightly wrapped (to seal in that flavour) in individual foil packets. Preheat a gas grill over medium-high heat or Oven 350F / 180C. To make 4 Foil Packets: Cut 8 sheets of 14 by 12-inch heavy duty aluminum foil. Layer two sheets of foil per packet to prevent breaking when turning over on the grill. To Make the Cous Cous: In a mixing bowl, add cous cous, vegetable stock and hot water. Stir and let the water absorb for a minute. To make the Lemon garlic Sauce: Add lemon, butter, garlic and parsley. Stir together until combined. To make Foil Parcels: In the center of each foil sheet (the ones you prepared in STEP 2), spoon 1/2 cup cous, cous. Add 1/2 cup of mixed vegetables (any quick cooking vegetables are OK), 6-8 uncooked shrimp, 1 tablespoon of Lemon and garlic dressing. Grill (or Bake) sealed side up until shrimp and couscous have cooked through, about 15 minutes. I like to turn them over on the grill around half way through the time. Serve with an extra lemon to squeeze over. I recommend using heavy duty aluminium foil and doubling up to make sure that juices don’t leak out. Especially if the kids are going to be ‘helping’ cook them on the grill. You can prep these early in the day and simply refrigerate until you are ready to cook them. Cut all your vegetables roughly the same thickness so they cook through evenly.